For years long, social media companies have been taking part only in top-of-the-funnel e-Commerce activities, such as product marketing. Now, the rules of the game are changing. Pinterest, Twitter, Facebook, Instagram and even Google - all of them are planning to add “buy buttons” to their platforms, cutting the distance between a product and a customer. From now on, consumers can discover and buy a product without the need to leave a particular social media. This allows media giants to build new revenue streams from their tremendous audiences and take advantage of people’s interest in buying items directly through their platforms. And that’s, of course, will affect the way merchants sell greatly. In this regard, we start a blog series aimed to cover the peculiarities of implementation of “buy buttons” on different social media channels, beginning with one of the pioneers in this field - Pinterest. Clever marketers have been exploiting an e-Commerce potential of Pinterest for a long time now, gradually turning it into a giant window case. And it actually works - nearly 30% of Pinterest users have purchased something after pinning it on the website. Every day millions of people browse pages pinned by their friends, celebrity tastemakers, and store representatives, looking for a new cool stuff to pin and, occasionally, buy. Due to the platform's mechanics, Pinterest is the network most likely to drive spontaneous purchasing. Who knows what you might stumble across? Nevertheless, buying always took some time to happen - only 10% of sales influenced by Pinterest were made in 24 hours after the product was pinned. Not to mention the fact that a half of those were made from different sources - either in-store or online. Buyable pins are called to bridge what is currently the main gap in Pinterest user experience: every time a shopper wants to buy a product, he or she needs to go elsewhere. By moving shoppers more quickly from pin to purchase, buy buttons could help brands boost sales considerably. There’s a big opportunity to increase impulse buying in particular, since about ⅓ of customers on Pinterest often buy items they see for the first time. “Blue means you can buy” - that’s how to spot a buyable pin. Then comes the checkout with Apple Pay or credit card and - a few days later - a virtual pin will “materialize” into a beautiful silk dress, or whatever you’ve ordered. Simple enough. OK, so the merchants will benefit as usually, but what about Pinterest? No, no transaction fees are planned. As for now, all the gain earned through buyable pins will go straight to retailers. Instead, Pinterest is going to make its profits by charging companies to promote their now-buyable pins. At the moment, money-generating-pins are still under development. Announced to release publicly anytime soon, they’ll be available initially for iPhones and iPads in the U.S. only. This bitter news for non-U.S. retailers and shoppers (or just Android fans) eager to join the e-Commerce social revolution should not disappoint you too much. After some period of testing and polishing, buyable pins will spread across the other platforms too, including desktop. There’s something else you need to know though. Since even such a giant like Pinterest can’t integrate with every single e-business directly, it has turned to companies like Shopify and Demandware to help. Thus, if you use any other e-Commerce solution to power your store - sorry, but you’ll have to wait. Or not, and migrate to migrate to Shopify. Most definitely, buyable pins will enhance the Pinterest experience, instead of detracting from it. But to compete for shoppers, Pinterest will need to rethink many aspects of its current UX. For example, the platform will need a way to filter search results by price and size, add buyable pins for entire shopping lists, an instrument to flag discounts, and notify whenever a pinned item goes on sale. By making it easier for businesses to benefit from the platform, Pinterest needs to consider that the ratio of merchants to average users is 1:1000 at best. Just 1 buyable pin among 100 of non-buyable (+ promoted ones) will hardly be convenient for shoppers. The most obvious way to spread buyable pins the across the user boards is to implement an affiliate program allowing to earn a revenue percent of any item purchased through a particular board. But how to ensure that promoted, affiliated, buyable pins will not force out user-driven pinning that gives the site its character? A major part of what has made Pinterest so successful as a purchase-booster is the strong element of unexpected discovery. Promoted pins, however, might ruin this experience. After all, it’s a challenge that’s hardly unique to Pinterest. There’s no playbook for buy buttons on social media and, most probably, won’t be any for quite a while. By method of trial and error, Pinterest and other media giants will break new ground and give the main answer: do people really want buying on social media? That’s the topic still to discuss. Stay tuned. 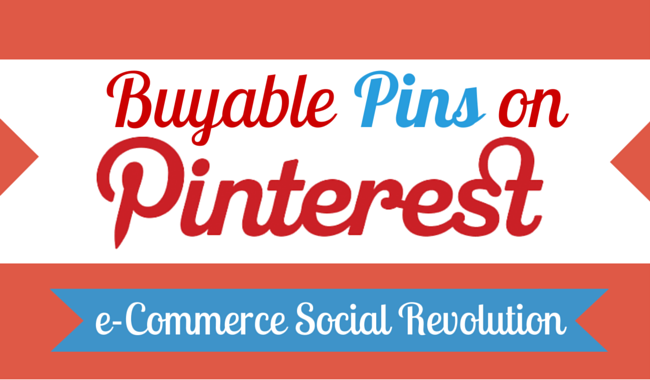 One thought on "Buyable Pins on Pinterest - e-Commerce Social Revolution"